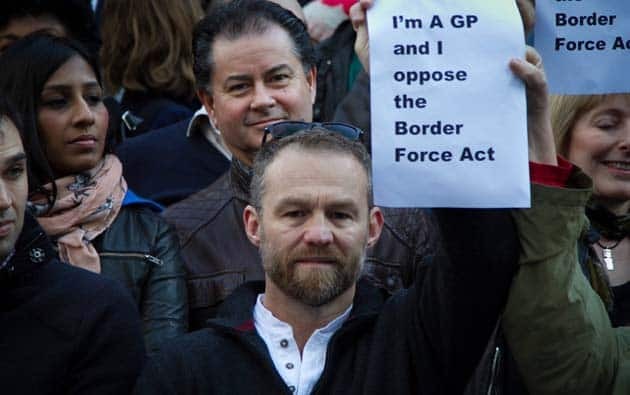 On a cold July Saturday morning, almost 300 medical professionals (doctors, nurses, social workers, physiotherapists) gathered on the steps of Sydney’s Town Hall to demonstrate their defiance of the Border Force Act. Other rallies were held in Melbourne, Adelaide, Broome, Faulconbridge, Coffs Harbour and at a number of individual hospitals. The protests followed the publication of a letter signed by 40 doctors, teachers, psychiatrists and other workers, all potentially “entrusted persons” subject to the Act, that openly challenged the government to prosecute them for defying the Act. The Act came into force on 1 July, with the complete support of parliamentary Labor. Besides creating a new para-military department (an extension of Operation Sovereign Borders), it also carries the threat of two-year jail sentences for any workers who blow the whistle on conditions in detention. The law is wide-reaching, covering any workers associated with detention and extending to any State, Territory or foreign government employees that provide a service to the Department of Immigration. It outlaws workers making any recordings or even notes of any kind. The law gives extraordinary powers to the government to cover up the abuses inside the detention regime. The World Medical Association condemned the law as “unethical” and has called on the government to repeal the legislation. It is appalling that Labor supported a law so obviously designed to silence detention workers and prevent media scrutiny of anything to do with immigration detention or Operation Sovereign Borders. Journalists obtaining information from an “entrusted person” are also guilty of an offence. Tony Abbott may have banned government Ministers from Q&A, but it didn’t matter, because Labor’s shadow Immigration Minister, Richard Marles appeared and did the government’s job for them, vigorously defending the Border Force Act. The Act means that those who have passed on the information about the mouldy tents and the feeding difficulties of baby Asha, returned to Nauru a few weeks ago, could get two years’ jail. Astonishingly, at the same time, Marles is saying that Labor stands for greater scrutiny and transparency of the detention regime. It is the second time in a month that Labor has disgraced itself by supporting government anti-refugee legislation. In late June, in the face of a High Court challenge to detention on Nauru, Labor supported legislation that the Liberals rushed through Parliament to try to thwart the challenge. To cap off a month of Labor farce, there was the fiasco that engulfed the government and then the Labor party, when it was revealed that the government had paid an asylum boat crew around $5000 each to return the boat to Indonesia. For days Labor tried to make political mileage by tagging the government for paying “people smugglers” using the same demonising rhetoric as the Liberals to describe the boat crew. A boat of 54 asylum seekers had been illegally intercepted (they were on their way to New Zealand), and held on a Customs boat on the high seas. The government then supplied two boats that looked like Indonesian fishing boats, gave them limited fuel, then bribed the crew to take the boats back to Indonesia. Labor didn’t care that the boat had been turned back. They said nothing about the fact that one of the returning boats ran out of fuel and the other crashed onto a reef near Landuti Island risking the lives of the asylum seekers. They said nothing about ending Abbott’s ban on resettling any UNHCR refugees from Indonesia. But all the outrage over paying the crew suddenly disappeared when it was revealed that Labor hands weren’t clean; previous Labor governments had also made payments to disrupt boat journeys. Yet the incident revealed that despite the Liberals’ claims, even after almost two years of Operation Sovereign Borders, the boats haven’t stopped. They are intercepted; turned around, and if necessary even transported to Vietnam or Sri Lanka. That’s another reason for the rally at Labor’s national conference. The Labor leaders need to know that whether it’s a Labor or Liberal government, the refugee movement will fight to stop turnbacks and to end offshore processing.